3 years ago I bought a telescope for saxon. (it's called Saxon, chuckle, chortle) for some reason it came with instructions that made no sense to me, as they were for All models in the saxon line. that took 2 pages of vague sketches with lots of arrows to points my el cheapo model did not posses. I tried looking it up on the line, got the same thing, but with comments about how easy it was... I tried finding a serial/model/any number on the paper work, but there was absolutely nothing anywhere that made sense to me. oh bloody hell! not the sharpest blade in the drawer, but never before considered myself a complete and utter moron either. until saxon the telescope. so tonight I hauled it over the Gord and Robert, my neighbours. I explained to gord my problem, showed what i'd tried, and again, neither of us saw anything. he points to a plaque slightly below the belly of the telescope where i'd not seen it. he took off the end cap - et voilà! we had a lovely view of the moon. so, problem solved by gord, the retired London bus driver in 20 mins flat! I am slightly miffed about why instructions are needed to use a telescope. Look into one and and see out the other. If the desired results are not obtained, you are looking into the wrong end. End caps make sense just like the lens cap on a camera. You want to prevent the optics from becoming damage or dirty prematurely. I owned a scope once that had a sighting scope attached to the top. That was a pain and a half trying to get the sighting scope aligned with the main tube view. But, once I accomplished that, finding the smallest dot in a sky full of blinking lights was simple. and you can't look into the wrong end, because you need to use the one attached to the side. anyway, got that dome and now it's clouding over. You are right. Some telescopes have the eyepiece at one end but at a 90° angle to the main body. 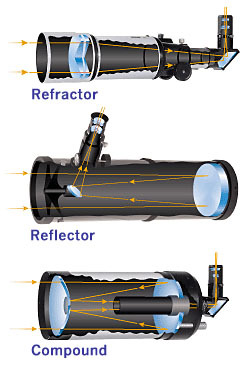 Actually, I think those scopes are called reflectorscopes (where is Juan when we need him?). Those are the ones with all kinds of extra pieces for different situations. see where the label sits... in plain site for a hobbit. I see a label right under the eyepiece. Is that what you could not find? So ... now that you can see the model # ... did you look up the manual on how to use this baby? yes, but really no need once I got the second end cap off. not the first, nor last time; i'm getting progressively denser - to my great annoyance. I just purchased 20 albums by the band Saxon! I will put them on here tonight Vikki Love! i'll introduce saxon to them! saxon was definitely off tonight... what a crab! i'll send the links to saxon; thank you! Do you think he would sing as well if he didn't have a microphone to hold on to? Sorry for the delay, was busy somewhere else. Lets begin from the start. - Catadioptrics. They are made with a combination of mirrors and lenses. Covers, as Dennis has explained, are used to keep dust and dirt out of the telescope when it is not being used, and have to be taken off so the light can enter the telescope as shown in the diagrams above. The main defining spec for a telescope is the aperture. It defines light gathering ability and from it we can guess how good and detailed an image it could be showing. After the aperture is the focal length, it can help us to have an idea about the apparent size of the images we can obtain. As for the phot you posted, the aperture of the telescope is 76 mm or roughly 3", its focal length is 700 mm (roughly 27.5"), dividing the focal length by the aperture (as if it were a camera objective) results in a f/9.2. The mount of the telescope in the image is an Altazimuthal, which means that you can move where it is pointing to from side to side (Azimuth) and up to down (Altitude). The idea of the rod in one side is to hold the telescope in position. ¿See the cross handle screws? they are used to release or hold the side rod and the support fork. You may have noted that in the rod extreme that is attached to the telescope that it also has a knob, it can be turned to move slowly the altitude that the telescope points to. The tube contraption that protudes to the side, that has two knobs and where you can place the eyepieces or oculars is called focuser, by turning the knobs you can adjust the focus if the eyepieces don't share the same focal point along their tube. The small telescope to the side of the focuser is called Finderscope. The idea is that in the inside of the finderscope there is a reticle (merely a cross made of two thin copper wires) and is mounted in a way that you can align it with the view of the main telescope (careful with those crews, they are intended to fix the position of the finder, not to alter it), so that to find something in the sky, you center it in the finderscope, then observe it through the eyepiece of the main telescope and has to be centered. I found a series of videos that can help you. Please ask whatever you didn't understand.